Today I watched something remarkable yet commonplace. 5000 people took to the streets of Hull in the 9th Jane Tomlinson memorial 10k road race. There is nothing unusual about 10k races. They are everywhere, and if you are that way inclined you can run one practically every weekend from April to October, wherever you live in the country. What was extraordinary, was the selfless dedication from so many people, including race marshals and first aiders, but mostly the wide range of people motivated to put their bodies through what is a very unnatural activity for a cause which was dear to their hearts, be it a loved one or a favourite charity. There were those who had run as a team, the friends of a guy who had lived life to the full, but who had died tragically in a car accident just a year ago. Workmates too, egging each other on and waiting at the finishing line so no one got left behind. Others, with face-emblazoned T-shirts in family groups commemorating a loved one who died from cancer, like Dame Jane Tomlinson the founder of this “madness” who, given a year to live when cancer spread to her bones in 2000, went on to live 7 more years full of the kind of physical feats many only dream of, and raising £1.85M to boot, for research she would never benefit from. Not forgetting too, the sweaty bodies clad in gaudy colours celebrating and raising money for everything from dyslexia to motor neurone disease; the firemen in full breathing apparatus, and the wizened old man in the green wig who looked too thin to walk let alone run, pushing a shopping-trolley full of loose change for his chosen charity. Others, hailed as heroes not just for today, were those who had served with forces in recent wars, who bore the scars of that conflict finishing a gruelling race alongside people whose bodies from birth had never let them walk let alone run, both in wheelchairs and proud of their different, yet parallel achievement. The city was thronging with people, and doing what it does best, celebrating life and love and comradeship and personal triumphs over adversity. Hull may not be a city on the radar like Manchester, Birmingham or London but its people have pride and courage in bucketloads and I am proud of my adopted city! But in the throng were the two people who made today special for me. 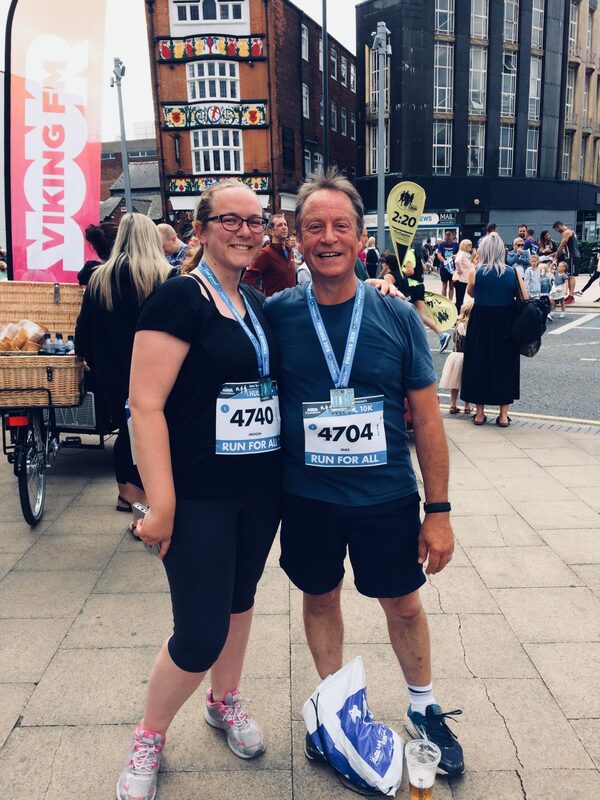 My Husband and daughter who ran together. He never left her side all the way around, though he was fitter and faster. And she who bought him the entry as a Christmas present as a sign of her belief in him to get well after a tough year which involved a major seizure. They didn’t do the best time, but when they crossed the line together, I closed my eyes, breathed deeply and radiated joy.